Lightly raced gelding, Mr Ahlberoni recorded his first metropolitan win on Wednesday by taking out the Sky Racing QTIS three year old Handicap over 1600m at Eagle Farm. Ridden by Matthew McGuren, who rode him to victory in his previous start, Mr Ahlberoni settled back in the field and despite the slow tempo he produced a strong run home to score by a length over runner up Hot Saga. A son of the late sire All Bar One, Mr Ahlberoni has always showed plenty of promise from an early age and he is certainly living up to that now. 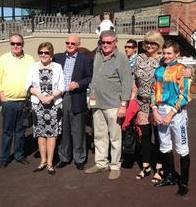 The win was his forth from only seven starts and with the QTIS bonus, it took his prizemoney tally to over $40,000.